Pets Costs > How Much Does a Betta Fish Cost? Betta fish are a colorful fish that lives in freshwater. These fish are also known as a “Siamese fighting fish” due to the fact that two Betta fish cannot swim in the same aquarium since males are rather hostile against each other, often resulting in death. Unlike other fish, a Betta fish generally eats very little and experts recommend that you feed it every other day. The cost of a Betta fish depends on the type and where you purchase it. On average, a Betta fish can cost anywhere from $2 to $10. Most of your big box retailers, such as Walmart and PetSmart, sell these fish, usually for less than $10. For instance, Petco has a variety to choose from, all retailing for less than $15. The Koi Betta, for example, retails for about $17, while the more common Veiltail retails for $3. The most common species, like the Halfmoon and Veiltail, will retail for about $2 to $10. Rare Betta fish that have exotic colors can fetch price tags as high as $1,000, and these exotic types are generally found at exotic pet stores. For example, the Western Blue Devil can retail for $500 to $700. Another rare species — the White Dragon King Crown Betta — can retail for $50 to $75. According to the website BetaFacts.com, the cost of a betta fish can be anywhere from $2 to as much as $1,000. Most of the common colors include red, green, royal blue, black and orange. Most will max out at two and a half inches. 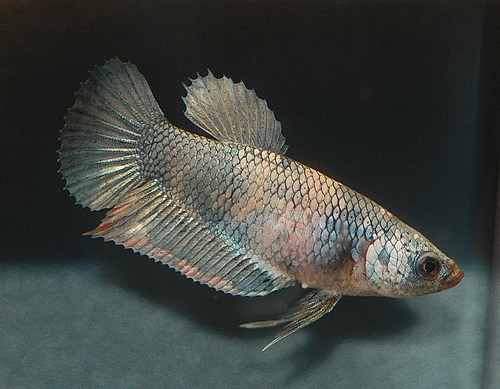 Popular species commonly found at the pet stores include the Veiltail, Elephant Ear Halfmoon, Halfmoon King, Doubletail, Paradise, Crowntail and Halfmoon Plakat. A Betta fish will always be sold individually, and it is highly recommended that you keep these fish to themselves as you will find that they do not get along with many other species. Betta fish have a lifespan that varies from 2 to 4 years. This Betta is produced by crossing the Veil Tail and the Crowntail. They won’t be as spiky as most, but it will have a pointier appearance. Known for its spiky tail and fins, these fish can be found at most pet stores due to its uniqueness. This is the name for any single tail non-Halfmoon Betta fish. When the tail has straight caudal edges, but don’t reach 180 degrees, it will be referred to this type of fish. As you can tell with its name, the tail splits into two equal lobes rather than one. When both fins flare, it almost creates a single tail. Tends to have a ruffled appearance, similar to the Rose mentioned below. Known to be very popular, the Halfmoon have a tail shaped just like that — a Halfmoon. Similar to the common Betta, this fish will be more active since they don’t have the elaborate fins to slow them down in the tank. It also has been said this type has a higher resistance to disease. Like the name says, its ruffled fins give it the appearance of a rose petal. This is a single-tailed Betta that has a round edge and can look very similar to the Halfmoon. However, when compared to the Halfmoon, the only difference is the “D” shaped caudal. These tend to be rather rare, but this fish will have a wider base of the tail and will narrow to a small point, similar to that of a spade. Similar to the Delta tail mentioned earlier, this tail can extend 160 degrees. This is the most common type you will find at a pet store and is known for its tail when it arches up, looking similar to a veil. A starter kit is highly recommended for a Betta fish. Due to the size of the box aquarium most stores send you home with, it is ideal to have an aquarium that is closer to one to five gallons; the larger the better. Starter kits will cost anywhere from $12 to $40 and will commonly come with a filter, tank and the hood. Aside from this aquarium starter kit, it’s also ideal to purchase a filter, substrate, thermometer, plants, a heater and water condition. Someone on Quora said they paid about $110 to set up their tank, which included live plants, gravel, an air pump, heater and the aquarium kit. If you’re purchasing the filter separate from the fish tank, plan on spending about $10. This filter is important because it helps maintain the cleanliness of the water and can keep any deadly disease at bay. A heater is also important because they need the warm water to thrive, usually 78 to 82 degrees Fahrenheit. If the tank didn’t have a heater, the fish may develop a disease or even death. A good heater for a smaller five-gallon tank shouldn’t cost more than $30. Food should cost no more than $5 per container and should last a few months. According to betta fish owners, flake food or bloodworms will suffice. Water conditioner, which can cost about $5, will remove the chlorine and any other toxins that may form in the water. While optional, these fish tend to enjoy a heating rock, which can cost anywhere from $7 to $20. These fish can live upwards of three years and only need a small tank or bowl to survive. It doesn’t have to be no more than a half gallon and water temperatures should be kept at 78 to 82 degrees Fahrenheit. It’s best to change the beta fish water at least every week. If there is a filter present in the fish tank, it’s best to change it every four weeks. When purchasing a beta fish, make sure that you look for healthier ones. The healthier fish are going to have a straight spine, no spots and the scales are going to be smoother. Since these fish are considered low maintenance, it makes for a good fish for beginners. More than one female can live in a community; however, if doing so, it’s highly recommended they have a good amount of plants to hide in. Males, on the other hand, should always be kept separate, even from the females because they tend to be aggressive. Most of your big box retailers are going to have these fish offered at the same price. If you want to get a rare Betta that has exotic colors, research a few pet stores in your area to see if they breed them. Keep in mind that they are rather hard to find due to how rare they are. Consider looking on Craigslist or even local garage sales to see if anyone is getting rid of their fish tank equipment. Believe it or not, but this is often a common item found for a bargain price. For a veil tail male. It was a very reasonable price.